‘Tumhari Sulu’ is a hit before release! Tight budget, high content and strong pre-sales spell early success for the Vidya Balan-starrer! The last few years have seen a growth in the success of content-driven films that are correctly priced. The Vidya Balan-starrer, “Tumhari Sulu” has been made with the same ethos and sentiment, with compelling, engaging content on a tight budget. Films like “Hindi Medium”, “Neerja” and “Shubh Mangal Saavdhan” have demonstrated that profits can be reaped by a singular focus on content. “Tumhari Sulu” has taken the baton ahead. The makers have put together an endearing slice-of-life story that will put a smile on the viewer’s face. 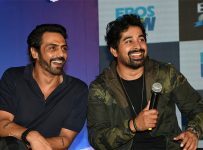 The character of Sulu has already resonated with families and housewives across the nation, while both the tracks, ‘Ban Ja Meri Rani’ and ‘Hawa Hawai’, have emerged instant chartbusters. The tightly budgeted film (Rs. 17 crores, including prints and advertising) has already been extensively monetized by way of pre-licensing of international, music, digital and satellite rights, and in-film brand associations, making the break-even requirement from the domestic box office very low. “Tumhari Sulu” releases on November 17.